Right behind your forehead lies the most recently evolved region of the human brain: the prefrontal cortex (PFC). It’s a major control center for abstract thinking, thought analysis, working memory, planning, decision making, regulating emotions, and many of the things we most strongly associate with being human. But in times of stress, the PFC is literally taken offline, allowing more primitive parts of the brain to take over. 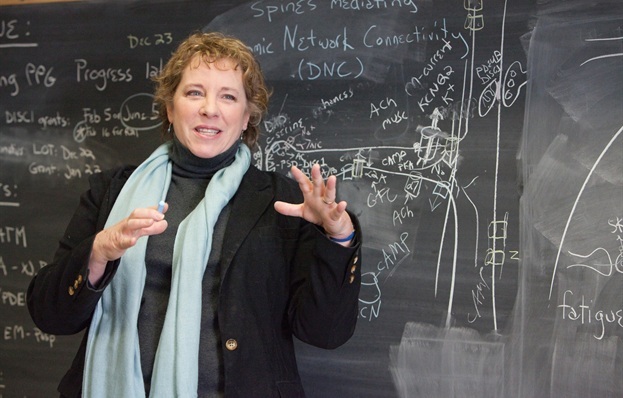 Amy Arnsten, a neuroscientist at the Yale School of Medicine, New Haven, CT, has pioneered the study of stress on the brain  and how impaired regulation of stress response in the PFC contributes to neurological disorders, such as Attention Deficit Hyperactivity Disorder (ADHD), schizophrenia [2, 3], and Alzheimer’s disease . In these disorders, cells in the PFC are negatively affected, while those in the primary sensory cortex, a more primitive part of the brain that processes vision and sound, are thought to remain relatively unscathed. With support from a 2013 NIH Director’s Pioneer Award, Arnsten hopes to uncover why the PFC is more vulnerable to disease than the primary sensory cortex—and how we might be able to prevent or reverse damage to these circuits.